Prime Minister Juha Sipilä has responded to criticism his administration received from the Chancellor of Justice Jaakko Jonkka over the weekend. 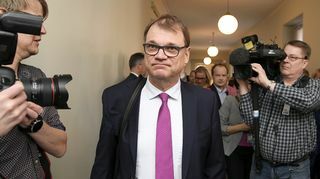 The Chancellor characterised Sipilä's government as careless in its approach to drafting new legislation, saying the administration had tried to hastily push through legislation. On Sunday Sipilä wrote in his blog that Jonkka's assertions were serious and largely caused by a lack of resources. Chancellor of Justice Jaakko Jonkka landed Juha Sipilä's administration in hot water over the weekend after criticising its record of poorly drafted legislation in the daily Helsingin Sanomat. Jonkka slammed government for attempting to hastily push through a host of new laws, some of which were found to be unconstitutional. He added that the government had summarily dismissed his views on flawed legislation. "It must be said that [the comments] came as a surprise to everyone. these observations were not known to myself, the government nor ministers," Sipilä said, adding that the Chancellor of Justice had not brought up the issues during cabinet meetings. Sipilä says he plans to speak with Jonkka later in the week and would make a statement about the issue on Friday or next week. Currently there are no ministers who have legal degrees in the current centre-right, tripartite administration. Legally, government is not required to have legal experts in the cabinet, ever since constitutional reforms helped to abolish such rules in the year 2000. Legal experts and opposition parties wasted no time in condemning the government's approach to drafting bills, with some calling for a probe. One political science professor suggested that it was time for the government to step aside. Foreign Minister Timo Soini weighed in, calling for the establishment of a Constitutional Court, an idea he had previously floated nearly two years ago. Soini said that such a body would be independent of the sitting Parliament and would have enough time to review draft bills.